Three protestors died on Thursday amid violent unrest in Iraqi city of Basra, where the anti-government protesters have been setting office buildings on fire. Three protestors died in Iraqi city of Basra during attacks on local government buildings, Reuters reported citing health and security sources. Several security officers were also reportedly wounded during the unrest. A local source told Sputnik Thursday that anti-government protesters in have set the offices of Shiite-dominated parties on fire. The headquarters of the National Wisdom Movement (Hikmah), which is led by cleric and politician Ammar Hakim, was attacked alongside offices belonging to the Badr Organization militia and the Asaib Ahl al-Haq paramilitary group, both of which had fought against the Islamic State terrorist group (Daesh, outlawed in Russia). Muqtada al-Sadr, Iraq's most influential Shiite politician, on Thursday called on the parliament to convene an emergency session before Sunday to address the situation in Basra. The violent protests in Basra have been underway for four days. The unrest however, has been rumbling since July, with people protesting unemployment and a poor state of communal services sector. The protests back then escalated further after the death of one of the protesters. 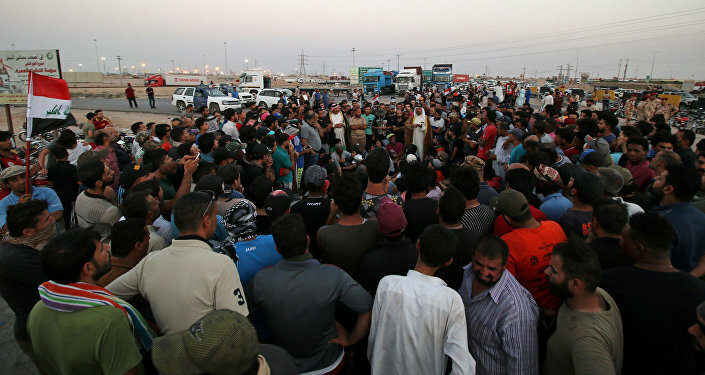 The Iraqi citizens demand that the country's authorities put an end to the disruptions in the electricity and water supplies and call for the job creation.